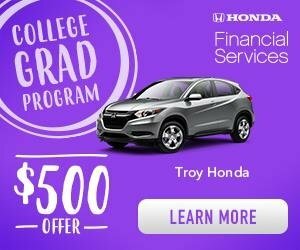 Whether you're looking to buy or lease a Honda, Troy Honda always has a number of special incentives that will have you on the road with the Honda of your choice. Honda provides a number of different ways for customers to save money through incentives such as low financing and more. Stop in to see the friendly sales staff here at Troy Honda anytime to learn about our latest deals. We are always happy to help those in the greater Troy, Royal Oak, Rochester, Birmingham, and Metro Detroit area get the vehicle of their choice for less money. Surf our coupons below for our latest offers.